From the Department of Molecular Neuroscience (U.-M.S.) and Sobell Department of Motor Neuroscience and Movement Disorders (M.S., K.P.B. ), UCL Institute of Neurology, London, UK; University of Kiel (S.A.S., G.D., F.H. ), Movement Disorders Clinic, Germany; Department of Paediatrics (L.C. ), Great Ormond Street Hospital, London, UK; Second Department of Neurology (M.S. ), University of Athens, Greece; and UCL Department of Molecular Neuroscience and UCL Genetics Institute (N.W.W. ), University College London, UK. Objective: To determine the genetic etiology in 2 consanguineous families who presented a novel phenotype of autosomal recessive juvenile amyotrophic lateral sclerosis associated with generalized dystonia. Methods: A combination of homozygosity mapping and whole-exome sequencing in the first family and Sanger sequencing of candidate genes in the second family were used. Results: Both families were found to have homozygous loss-of-function mutations in the amyotrophic lateral sclerosis 2 (juvenile) (ALS2) gene. Conclusions: We report generalized dystonia and cerebellar signs in association with ALS2-related disease. We suggest that the ALS2 gene should be screened for mutations in patients who present with a similar phenotype. Using exome sequencing and a candidate gene sequencing approach, we identified mutations in ALS2 in 2 consanguineous families with a novel phenotype of generalized dystonia and a spastic quadriparesis. Study approval was given by each local ethics committee, and both families gave informed consent. Pedigrees for the families are presented in the figure. The clinical characteristics of the patients are described in the results section. An arrow indicates the proband in each family. Homozygosity mapping (in II:1–II:3) and exome sequencing (in II:2) was performed (figure, A). Only variants within regions of homozygosity, shared only by the affected siblings, were used for filtering. We filtered out synonymous variants and any variant present in a range of publicly available databases of sequence variation (dbSNP, 1000 Genomes, Complete Genomic 69 Database, and National Heart, Lung, and Blood Institute [NHLBI] Exome Sequencing Project database). A candidate gene sequencing approach was used in this family for the following genes: SPG11, Spastizin, and ALS2 (figure, B). All coding exons and flanking intronic sequences were amplified by touchdown PCR and Sanger sequenced. The index case (figure, A [II:2]) is of Bangladeshi descent. Early motor milestones were normal; however, she failed to walk independently, prompting assessment at age 2 years. Assessment at this time revealed a mild spastic diplegia with global developmental delay and microcephaly (below 2nd percentile). She presented to our center at age 13 years; her examination revealed a few beats of nystagmus, a facetious smile, and anarthria. There was marked spasticity and contractures in the limbs with dystonic posturing of the hands. Global muscle weakness was present with distal lower limb wasting suggesting lower motor neuron involvement. She required a motorized wheelchair. Subsequently, surgical intervention was required for a rapidly progressive scoliosis. A trial of l-dopa was not helpful. Individual II:3 achieved normal motor milestones up until 12 months of age when he started toe-walking. Examination at age 7 years revealed microcephaly (2nd to 9th percentile), nystagmoid jerks, and intermittent head titubation. In the upper and lower limbs, there was spasticity with clonus and dystonic posturing of the arms and trunk. Gait examination showed truncal sway, suggestive of ataxia. Neck flexors were weak as were proximal and distal muscle groups. Reflexes were pathologically brisk with bilateral extensor plantars. There was a mild scoliosis. Brain MRI in patient II:2 showed mild lack of white matter bulk and some immaturity of the white matter signal. CSF and an extensive metabolic screen were normal. A muscle biopsy showed angular atrophic fibers with grouping of fast and slow fibers in keeping with a neurogenic component. The index case (figure, B [IV:1]), a 32-year-old man of Turkish descent (with a similarly affected sister, IV:2), has a complicated dystonia syndrome. Birth and early milestones were normal: he crawled at the age of 8 months and sat at the age of 9 months. Symptom onset was at approximately age 2 to 3 years when he developed an increased tone and difficulty walking. He required a wheelchair from age 8. Speech impairment was observed at age 4 years, which progressed to anarthria at age 15. When he first presented to our hospital at age 18 years, he had a combination of profound weakness, spasticity, and generalized dystonia with dystonic grimacing, intermittent retrocollis, and severe opisthotonus. He is of small stature. Neuraxis MRI, electrophysiology (nerve conduction studies, somatosensory evoked potentials, and blink reflex), and neuropsychological testing were normal at age 18. The patient underwent deep brain stimulation surgery at age 25 years with an unsatisfactory response and further progressive decline. Presently, he is in a cachectic state and lives in a home. He is anarthric and communicates with his eyes. Cognitive function appears relatively intact. Vision is normal. He has dysphagia requiring a percutaneous endoscopic gastrostomy and is incontinent of urine. He has profound muscle atrophy with severe weakness and contractures in both upper and lower limbs. He is on baclofen, tizanidine, and tetrazepam, and receives focal botulinum toxin injections. See videos 1 and 2 on the Neurology® Web site at Neurology.org, which show affected individuals from families 1 and 2. After exome variant filtering, one novel homozygous variant remained, c.G2002T: p.G668X in ALS2 (ENST00000264276). Sanger sequencing revealed that both affected siblings (II:2 and II:3) are homozygous for the mutation. Their parents (I:1 and I:2) are heterozygous carriers and the unaffected sibling (II:1) does not carry the mutation. Sanger sequencing of SPG11 and Spastizin did not reveal any pathogenic mutations. A homozygous frameshift mutation, c.4573dupG; p.V1525fs (ENST00000264276), was identified in the ALS2 gene in both IV:1 and IV:2, but was not present in the unaffected siblings. The parents were confirmed to be heterozygous carriers of the mutation. Three stop-gain, 1 frameshift, and no splicing ALS2 variants are recorded in the NHLBI Exome Variant Server in approximately 11,840 alleles. 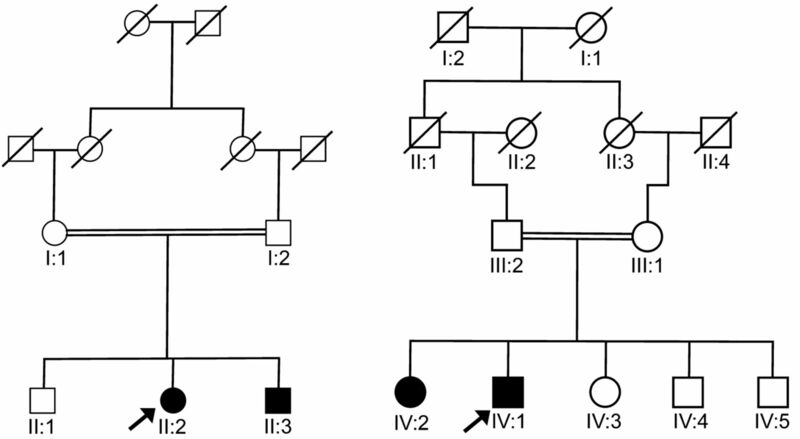 The ALS2 mutations in family 1 and 2 are absent from this database. The differential diagnosis of autosomal recessive dystonia-spasticity syndromes is wide. Tyrosine hydroxylase deficiency may be complicated by additional signs, such as ptosis or oculogyric crises, and is important to exclude as a differential because early treatment with l-dopa can influence outcome. Patients with parkin mutations can present with foot dystonia, parkinsonism, and brisk reflexes. FBXO7 mutations are associated with a parkinsonian-pyramidal phenotype sometimes accompanied by dystonia. Several of the autosomal recessive spastic paraparesis syndromes can be complicated by dystonia, among other signs (e.g., thinning of the corpus callosum occurs in SPG11 while retinal degeneration and mental retardation can occur in SPG15). Finally, several neurometabolic conditions can present with a young-onset dystonia-spasticity-ataxia syndrome (e.g., GM1 gangliosidosis, Kufs disease type B, and Niemann-Pick disease type C). The prioritization of genetic testing in patients is guided by the presence or absence of additional signs. We report generalized dystonia, poorly responsive to deep brain stimulation, in association with ALS2-related disease. Other novel clinical findings in family 1 include microcephaly and cerebellar signs. It is not clear whether microcephaly or cerebellar signs are a result of the ALS2 mutation. Additional detailed clinical descriptions of patients with ALS2 mutations will help to clarify this. In a wild-type mice model of the disease, ALS2 was highly expressed in the granular and Purkinje layers of the cerebellum, and ALS2-null mice have been found to develop an age-dependent slowly progressive loss of cerebellar Purkinje cells.7 The ALS2 protein binds to a small guanosine triphosphatase RAB5 and functions as a guanine nucleotide exchange factor for RAB5 and has a role in intracellular endosomal trafficking,7 highlighting that this may be an important biological pathway or mechanism through which dystonia may occur. This report adds to the growing literature widening the phenotypic spectrum of genetic disorders using next-generation sequencing. We propose that the ALS2 gene should be screened for mutations in patients who present with a similar phenotype. Una-Marie Sheerin and Susanne A. Schneider: drafting/revising the manuscript for content, including medical writing for content, study design, analysis or interpretation of data. Franziska Hopfner, Guenther Deuschl, Lucinda Carr, and Maria Stamelou: drafting/revising the manuscript for content, including medical writing for content. Nicholas W. Wood and Kailash P. Bhatia: drafting/revising the manuscript for content, including medical writing for content, study concept or design. Supported in part by the Wellcome Trust/Medical Research Council (MRC) Joint Call in Neurodegeneration award (WT089698) to the UK Parkinson's Disease Consortium whose members are from the UCL/Institute of Neurology, the University of Sheffield, and the MRC Protein Phosphorylation Unit at the University of Dundee. This work was undertaken at UCLH/UCL, who received a proportion of funding from the Department of Health's NIHR Biomedical Research Centre's funding scheme. U. Sheerin is funded by an MRC fellowship grant. S. Schneider was the recipient of a Bosch fast-track stipend. She holds grants from the Eva Luise and Horst Köhler Foundation for rare diseases and the Novartis Foundation. She has received financial support to attend meetings from Teva and Ipsen Pharma. L. Carr reports no disclosures relevant to the manuscript. G. Deuschl is a consultant for Medtronic, Sapiens, and Britannica. He holds grants from the German Research Council, German Ministry of Education and Research, and Medronic. He received honoraria from Medtronic and Desitin. He receives royalties from Thieme Publishers. F. Hopfner received a grant from the Braun Foundation, intramural funding from the Christian-Albrechts-University Kiel, and is a government employee. M. Stamelou received travel and speaker honoraria from Ipsen, Novartis, and the Movement Disorders Society. N. Wood holds grants from the Bachmann-Strauss Dystonia Parkinson Foundation, the MRC, and the Wellcome Trust. K. Bhatia has received honoraria/financial support to speak/attend meetings from GSK, Boehringer Ingelheim, Ipsen, Merz, and Orion Pharma companies. He holds grants from the Bachmann-Strauss Dystonia Parkinson Foundation, the Dystonia Society UK, and the Halley Stewart Trust. Go to Neurology.org for full disclosures. Accepted in final form December 9, 2013.
. The gene encoding alsin, a protein with three guanine-nucleotide exchange factor domains, is mutated in a form of recessive amyotrophic lateral sclerosis. Nat Genet 2001;29:160–165.
. Infantile-onset ascending hereditary spastic paralysis is associated with mutations in the alsin gene. Am J Hum Genet 2002;71:518–527.
. An ALS2 gene mutation causes hereditary spastic paraplegia in a Pakistani kindred. Ann Neurol 2003;53:144–145.
. Novel compound heterozygous ALS2 mutations cause juvenile amyotrophic lateral sclerosis in Japan. Neurology 2009;73:2124–2126.
. Infantile ascending hereditary spastic paralysis (IAHSP): clinical features in 11 families. Neurology 2003;60:674–682.
. A novel ALS2 splice-site mutation in a Cypriot juvenile-onset primary lateral sclerosis family. Neurology 2009;72:28–32.
. Mice deficient in the Rab5 guanine nucleotide exchange factor ALS2/alsin exhibit age-dependent neurological deficits and altered endosome trafficking. Hum Mol Genet 2006;15:233–250.